It was a good crowd at the Museum for the rescheduled Garrick Palmer talk - the original date having been 'snowed off' in spectacular fashion. Curator of Art Susan Ward asked Garrick to talk about some of the Museum's pieces dating back from the 1950s and Garrick rewarded us with anecdotes which sounded so fresh in his mind but harked but to a completely different era in art education and print publishing. His account of the making of his painting of Nuns on Bournemouth beach and a former significant girlfriend particularly gently amusing. Garrick's display at the Museum continues until 22nd April although his highly successful show here at the gallery has now finished. Greenwich Printmaker Kit Boyd came along to the Gallery after the talk to catch up with an artistic hero Garrick Palmer. We are so pleased to hear that Agata's painting 'Flying Rat' has been selected for the Threadneedle prize 'Figurative Art Today' which opens on the 31st January and runs until 17th February. We will be going along to finally see this painting 'in the flesh' at the Mall Galleries, London. Agata has been mining a rich and fruitful seam with a series of paintings depicting women working making beautiful works from grubby subjects. We are so pleased that after a lovely chat in his Thameside studio last week Ray Richardson, stalwart of the London art scene, has agreed to give Jack House Gallery a show of his graphic works in 2018. Hopefully to coincide with a certain football match. Gallery dog Trixie will look forward to making the acquaintance of Wee Bri. Whilst we were obviously disappointed that Amartey Golding didn't win we were so pleased to see the number of women nominated as finalists in this year's Young Masters and what turned out to be an all female winning list in all sections of the competition. The judges and gallerist Cynthia Corbett, who established the Prize in 2008, professed themselves baffled as to the whys and wherefores of such a strong female showing but there was no doubting the quality of work and Amartey was pleased to have the opportunity to show in such good company. For a full list of the winners go to the website www.young-masters.co.uk. Trixie looks less than sure but Stephen Morgan proved a welcome addition to the Portsmouth art scene. There was much excitement at the opening of Amartey Golding's show GA.BO.SIA on Saturday night when our very own, first ever Labour MP for Portsmouth South showed up. Looking as fresh as a daisy despite no sleep Stephen Morgan charmed everyone and many selfies were snapped for posterity. To wake up in a Labour constituency on Friday 9th was a cause for great celebration here at the gallery!! Amartey Golding shortlisted Young Master! Announced yesterday the shortlist for Young Masters 2017 and we are ecstatic that Amartey is on it! We will hear who the winner is in June so watch this space. Two talks by Rafael Klein and two very different conversations - both fascinating. The first of these two scheduled events connected with Family Tree took place in Portsmouth Cathedral when Dean David Brindley displayed his Art History credentials in a discussion about the long and varied part that Cathedrals have played in the commissioning and display of art and how Klein's work interacts with the spaces in which it is shown both physically and spiritually. The other illustrated talk took place in the gallery and was a veritable crash course in sculptural techniques encompassing lost wax, welding and laser cutting for public commissions. Rafael Klein also talked about his development from painter to sculptor and how the former informs and is essential to the latter. Thanks to all who came to both events. Agata Wojcieszkiewicz's show Assimilations opened on Thursday evening to unanimous acclaim. We've seldom had such a big crowd in total agreement that this work needs to be seen to be truly appreciated. 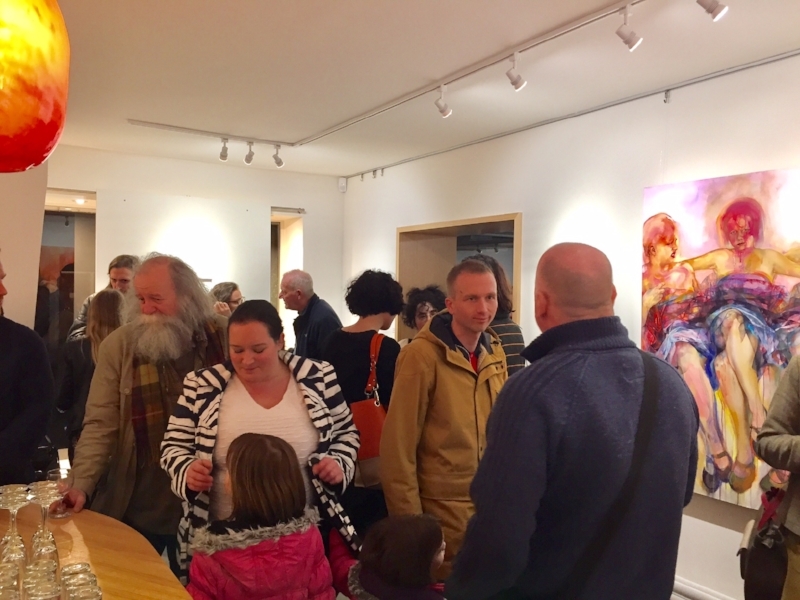 A great turn out for 'Small Works' our exhibition of very small pictures by an array of artists. Some are local to Portsmouth and you can always rely on artists to come out on a damp wintry evening to support each other and enjoy the chat. It won't surprise those that saw Amartey Golding's film in the gallery in October 2016 that we caused something of a stir in what was Jack House Gallery's first Art Fair. Our little custom built screening booth was the busiest stand at the fair with a constant stream of visitors eager to see the most talked about exhibit of LAF 2017. With the work of Amartey Golding you are never quite sure what will happen and he does rather fly by the seat of his pants! For a little while we thought we'd be screening 'Strictly' instead of this stunningly beautiful and very thought provoking first film. Initial technical problems soon sorted the response was overwhelmingly positive and the main film was followed by another 'short' documentary film featuring an interview with Amartey and his brother Solomon. This fly on the wall insight into their lives had Amartey's Auntie tut-tutting at the pile of dirty dishes in his kitchen. We broke our normal rules and re-hung here at the gallery in order to meet demand. John Green is a prolific artist and we have had a lot of work to show so those of you that have been already it's now worth another trip. For those that haven't there's only one more week of this show left so come and see this excellent display of John's draughtsmanship and versatility. Now that the stock of his work is down to 'manageable' levels we have started adding it to his artist page on the website so have a look if you can't along to the gallery. It is the aura of portent that first strikes the onlooker as this artist’s recent collection is revealed, the intimation that something insidious is afoot and change is seeping into the canvas. Rachel Levitas says that she believes most artists have the ability to sense a shift in the air and can perceive potentially catastrophic indicators before anyone else. As we ponder the foxes foraging on a draped trestle, the augury of some sort of collapse beneath the weight of their mischief, is never far from our suspicion. Foxes, flags, dahlias, her vision is indisputably British and her family background takes some surprising routes across an unusual yet familiar map of political history and the artist grew up seeing the world through a particular ideological prism that took her beyond the iron curtain. In the foxes, we see new and opportunistic forces as they dismantle the old guard, the blowsy flowers referencing the more reverentially observed ostentatious still life displays of game and bloom once commissioned by the elite country estates. Levitas finds much to be optimistic about however and there is a shimmer of playfulness in her work. Still Life Interrupted includes pictures that are an interruption of her previous set of expressions, Still Life Disturbed, and the series of works je suis désolé, considers the relationship of Manet and his muse, Berthe Morrisot. The eclipse of Berthe in these paintings is a comment on the role of artist and his muse, in this case, his female muse, also an artist. Madame Swann, although a fictional literary character, is also a muse and in the Madame Swann paintings represents the relentless social surge of her animal equivalent, the urban fox. Not dissimilar to the fox, the artist herself has pluck but patience, plus a shrewd eye for advantage and her interest in the animals as opportunists was triggered by the sight of a single arrogant fox sitting on her doorstep that waited unfalteringly to be fed. Brought up in the far North, she has found stability in the city with a growing family, teaching, talking, observing, her airy modern studio overlooking Burgess Park a far cry from the stereotypical clutter of creativity. It is full of thought. Educated at a “state comp” she was influenced by one of those fabled inspiring teachers who successfully saw several of his protégés arrive at the top institutions. Levitas herself studied at Camberwell before “falling in love” with the crumbling metaphorical and physical edifice of the Royal Academy Schools, saying that stepping into the ‘still life room’ and finding it filled with skeletons, a model of a flayed man and the cast of a real crucifix, she felt a jolt of recognition. Having trained extensively as a printmaker, her fascination is with discovery, deconstruction and corruption, and has won her several prizes including the Lynn Painter-Stainers. The smaller pieces, as she experiments with surface and quality, have the effect of decoration on porcelain, possibly echoing the country house hierarchy, of china to be laid out, to be smashed. Grand trees also inhabit her landscapes as sentient signposts, prophesying the unsaid. While we have fun at the table, we disregard the warning of impending disintegration at our peril and certain sleek scavengers won’t pass up the chance to augment their good fortune. That's Solent TV's Shan Robins reports about our first show of 2016. Our very special opening of "Dockies" with John Green's beautiful paintings kicks off 2016 at Jack House with a great success. Even the Mayor was there on the opening night of John's first Portsmouth show. A massive dose of german expressionism arrived all the way from Bochum to Portsmouth in the back of a Mini! They are larger than life and definitely brighten up our early winter evenings. We had quite a few guests at the preview including our first artist to show at Jack House Amartey Golding! He is also the subject in one of Stephan's paintings, see if you can spot him! Of course Woody came too all the way from the big smoke just to see Trixie the gallery dog! Dylan Thomas's 'Under Milk Wood' read by Richard Stride with images by Sir Peter Blake and paintings by Lyndon Hayes. Dylan Thomas's 'Under Milk Wood' read by Richard Stride with images by Sir Peter Blake as well as paintings by Lyndon Hayes.